This module (isis-module-poly) provides a set of helpers to support the definition of polymorphic associations; that is: relationships from one persistent entity to another by means of a (Java) interface. Note that an library has has been superceded by a design pattern that does not require any supporting classes. Rather than emit events on the event bus, the design pattern suggests defining an SPI interface to be implemented. Modules that use the SPI pattern (as opposed to this module) include Alias subdomain and Classification subdomain. Persistable polymorphic associations are important because they allow decoupling between classes using the dependency inversion principle; module dependencies can therefore by kept acyclic. This is key to long-term maintainability of the codebase (avoiding the big ball of mud anti-pattern). While JDO/DataNucleus has several built-in strategies to support polymorphic associations, none allow both a persisted reference to be arbitrarily extensible as well as supporting foreign keys (for RDBMS-enforced referential integrity). The purpose of this module is therefore to provide helper classes that use a different approach, namely the "table of two halves" pattern. The "table of two halves" pattern models the relationship tuple itself as a class hierarchy. The supertype table holds a generic polymorphic reference to the target object (leveraging Apache Isis' Bookmark Service) while the subtype table holds a foreign key is held within the subtype. It is quite possible to implement the "table of two halves" pattern without using the helpers provided by this module; indeed arguably there’s more value in the demo application that accompanies this module (discussed below) than in the helpers themselves. Still, the helpers do provide useful structure to help implement the pattern. 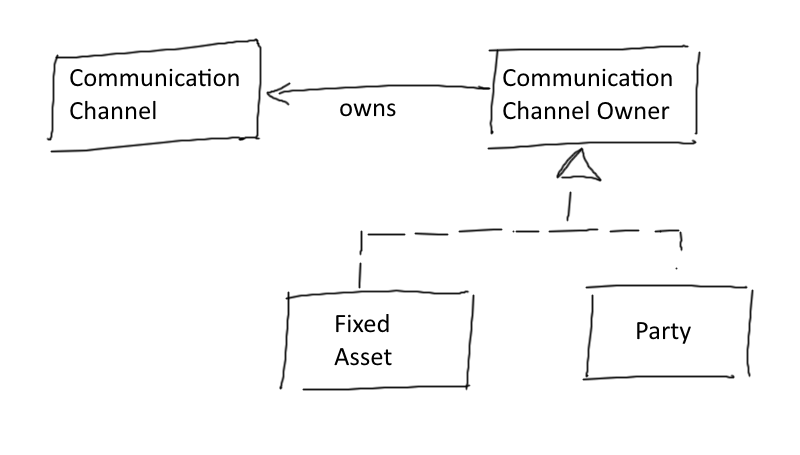 1-to-1 and n-to-1: a CommunicationChannel may be owned by a CommunicationChannelOwner. 1-to-1: a Case may have a primary CaseContent. The CommunicationChannel and Case are regular entities, while CommunicationChannelOwner and CaseContent are (Java) interfaces. The demo app also has two entities, FixedAsset and Party, that both implement each of these interfaces. 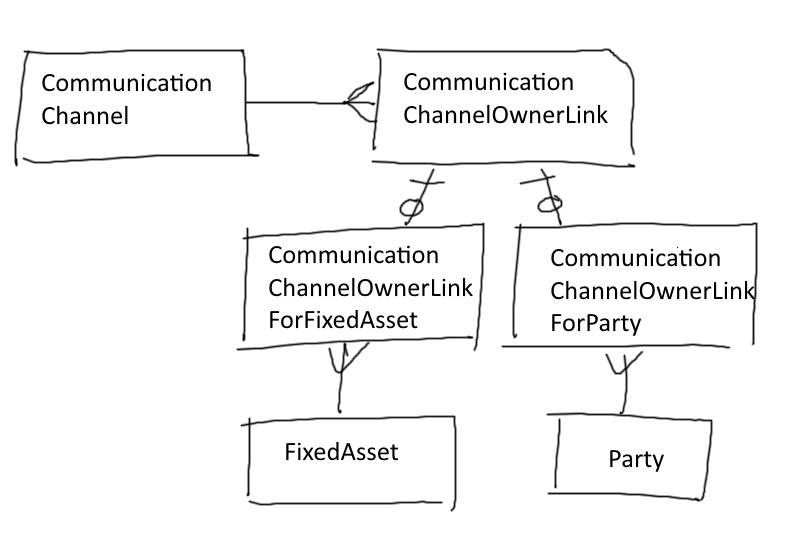 Each FixedAsset may "own" a single CommunicationChannel, while a Party may "own" multiple CommunicationChannel`s. 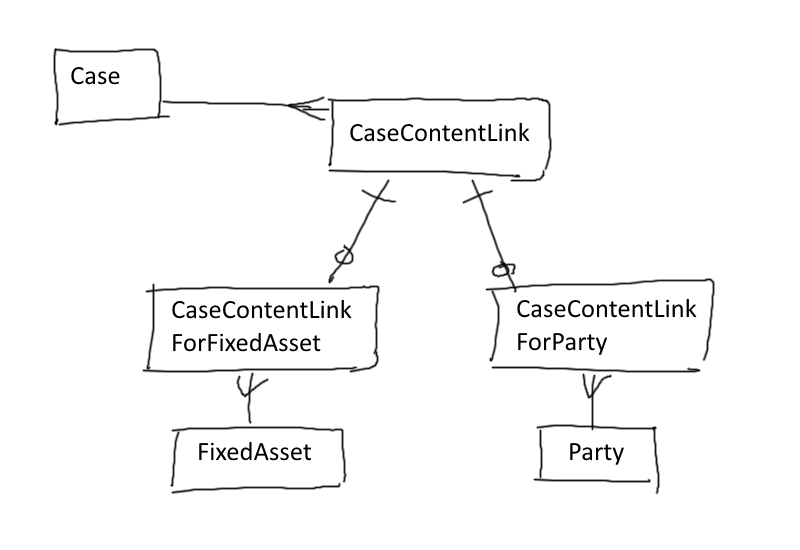 Meanwhile both `FixedAsset and Party can be added as the "contents" of multiple `Case`s, and either can be used as a `Case’s "primary content". 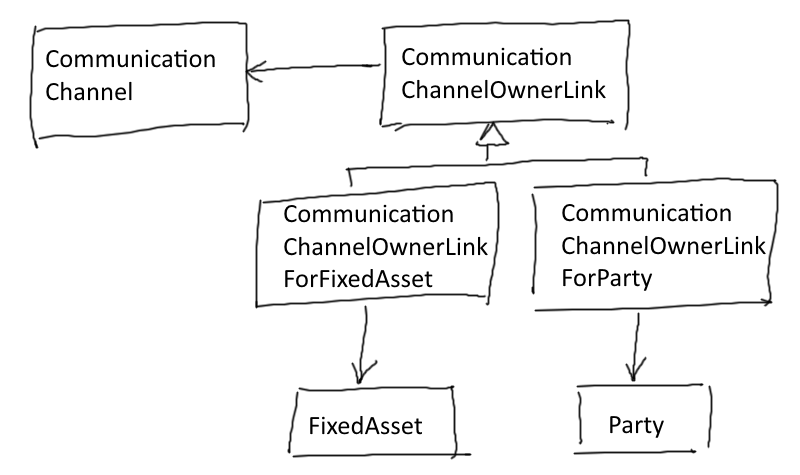 Here the CommunicationChannelOwnerLink is a persistent entity that has subtypes for each of the implementations of the CommunicationChannelOwner interface, namely CommunicationChannelOwnerLinkForFixedAsset and CommunicationChannelOwnerLinkForParty. This inheritance hierarchy can be persisted using any of the [standard strategies](http://www.datanucleus.org/products/datanucleus/jdo/orm/inheritance.html) supported by JDO/DataNucleus. Note how Case actually has two polymorphic associations: a 1:n to its "contents", and a 1:1 to its "primary content". Here the CaseContentLink is a persistent entity that (as for communication channels) has subtypes for each of the implementations of the CaseContent interface. 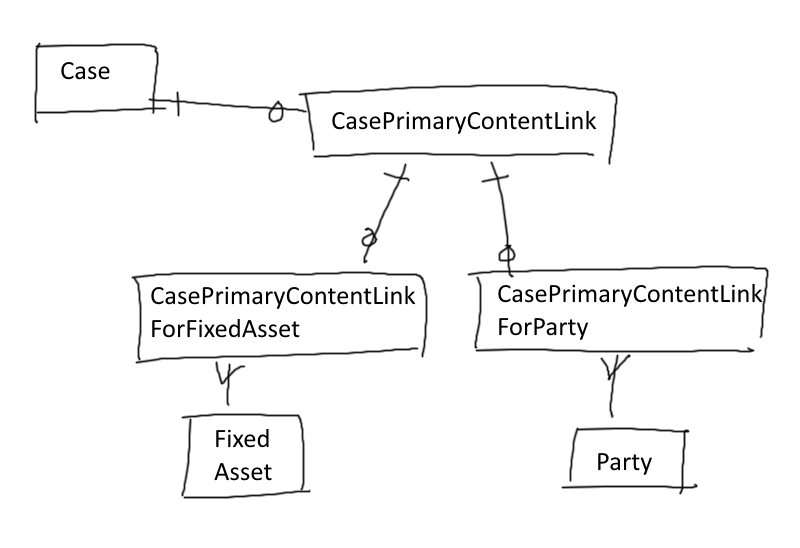 But because Case actually has two associations to CaseContent, there is also a further CasePrimaryContentLink persistent entity, again with subtypes. 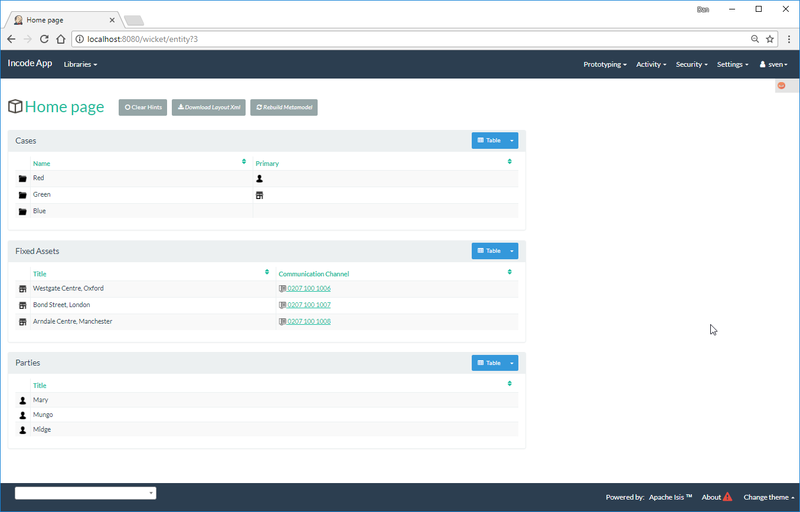 The module’s functionality can be explored by running the quickstart with example usage using the org.incode.domainapp.example.app.modules.ExampleDomLibPolyAppManifest. The FixedAsset entity is similar in that it also has a collection of Case`s. 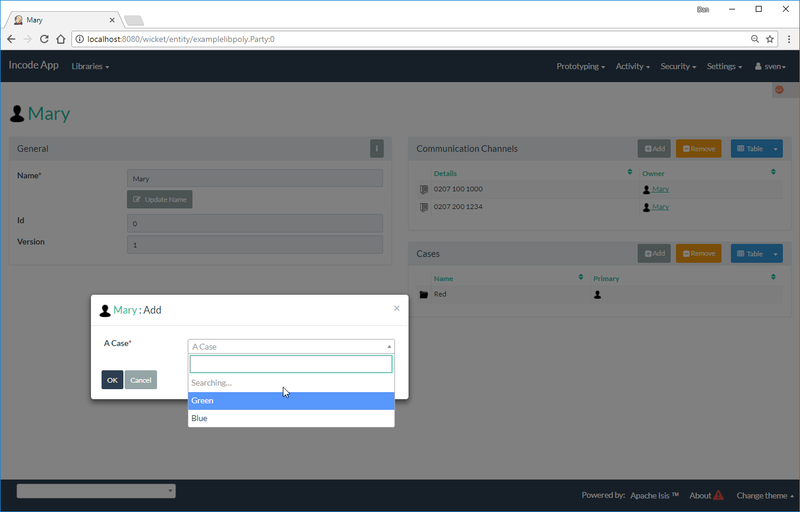 However, in our demo app we have a business rule that the fixed asset can own only a single `CommunicationChannel. 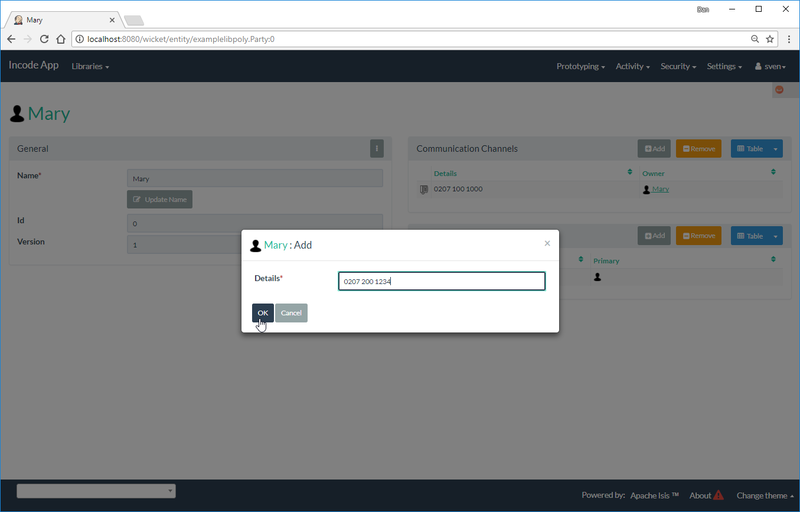 In this demo app, because communication channels are not shared by entities, this will actually create and persist the corresponding CommunicationChannel. Here the rule is slightly different: the Case already exists and so the party is merely associated with an existing case. The key design idea is to leverage Isis' event bus service to determine which concrete subtype should be created and persisted to hold the association. if no subscriber updates the event, then the association cannot be created and an exception is thrown. The helper classes provided by this module factor out some of the boilerplate relating to this design, however there is (necessarily) quite a lot of domain-specific code. What’s important is understanding the design and how to replicate it. 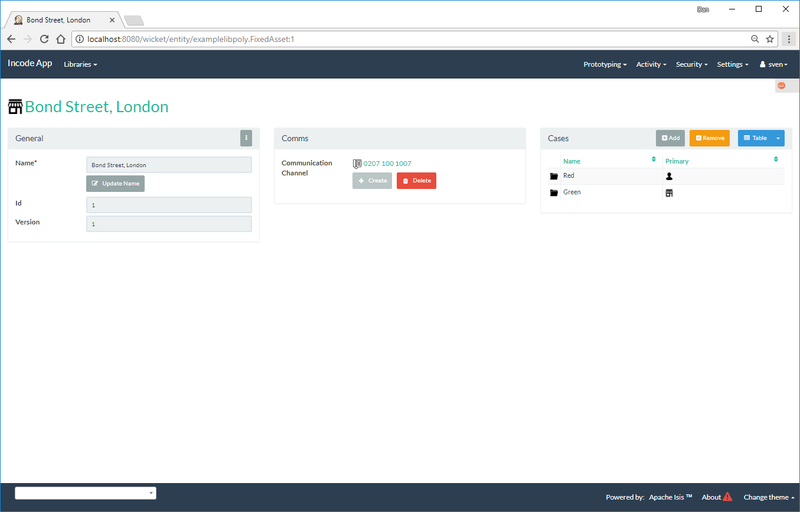 Create a subscriber to the event for each implementation of the target interface. We suggest using a nested static class of the subtype. 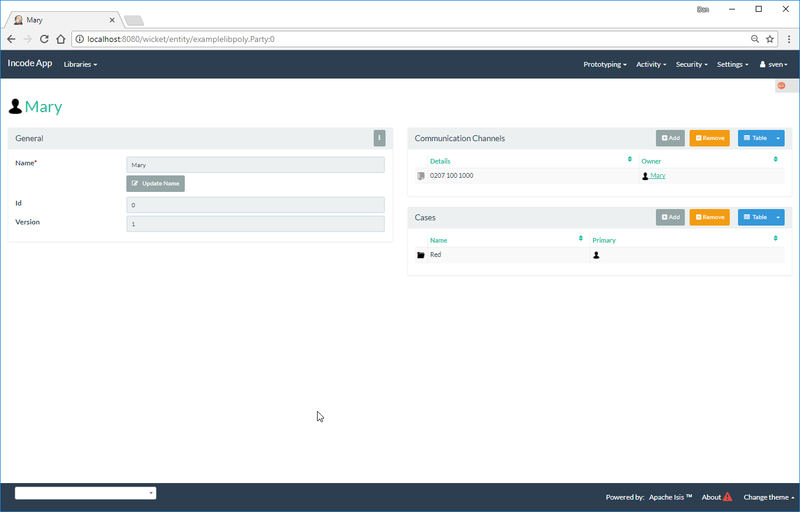 PolymorphicAssociationLink.InstantiateEvent - a superclass for the "instantiate event"
Let’s look at each in more detail, relating back to the "communication channel owner" association in the demo app. The subclass is required to implement the subject, polymorphicObjectType and the polymorphicIdentifier properties; these should delegate to the "concrete" properties. Thus, the abstract properties defined by PolymorphicAssociationLink just delegate to corresponding persisted (JDO annotated) properties in CommunicationChannelOwnerLink. Also note the pattern passed to the constructor; this is used to generate a title. The PolymorphicAssociationLink.InstantiateEvent is the base class to derive an instantiate event type for each polymorphic association (step 3 in the pattern recipe). Having derived event classes means that the event subscribers need only receive the exact events that they care about. Any subclass is required to take the last three parameters in its constructor; the event is instantiated reflectively by PolymorphicAssociationLink.Factory. Unlike the other two classes, the factory is not subclassed. Instead, it should be instantiated as appropriate. 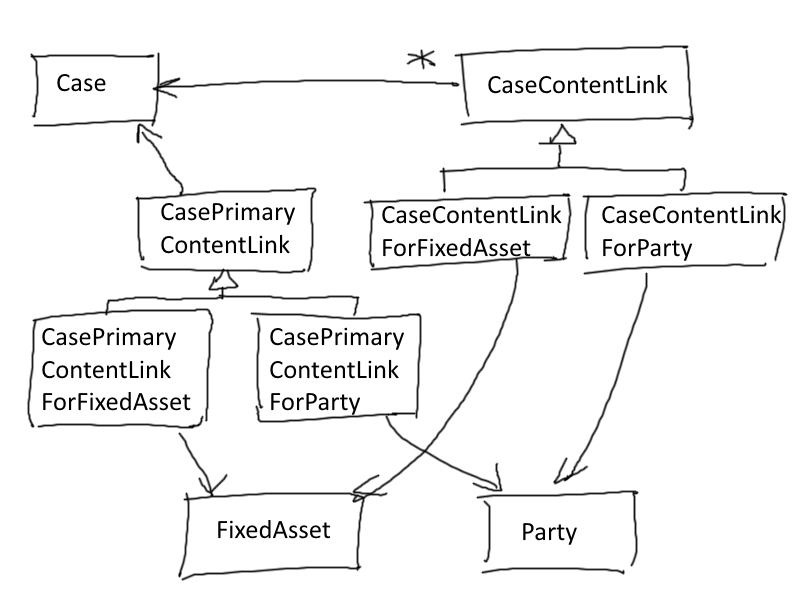 Typically this will be in a repository service for the *Link entity (step 4 in the pattern recipe). Note that it is necessary to inject services into the factory (container.injectServicesInto(…​)). The helper classes provided by this module are actually only used by the "subject" domain entity (or the containing package for said entity); steps 1 through 4 in the pattern recipe. But what about the implementation for an entity (such as FixedAsset) that wishes to be used in such a polymorphic association, ie the final steps 5 and 6? where the inherited setPolymorphicReference(…​) method is overridden to also populate the JDO persisted property (fixedAsset in this case). The thing to note is that although there are quite a few steps (1 through 4, in fact) to make an association polymorphic, the steps to then reuse that polymorphic association (steps 5 and 6) are really rather trivial. The demo application has a couple of other interesting implementation details - not to do with polymorphic associations - but noteworthy nonetheless. 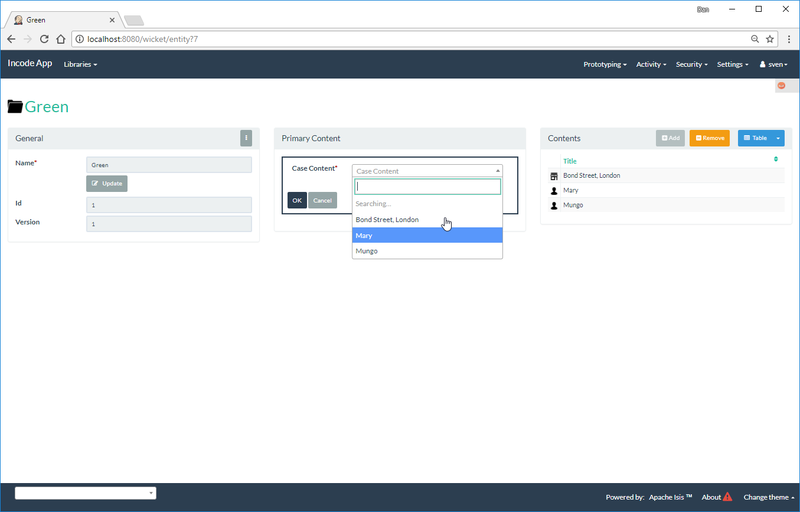 With the Case class there is a "case contents" and a "primary case content"; the idea being that the primary content should be one in the "contents" collection. It (currently) isn’t possible to define (fully abstract) properties on interfaces, meaning that by default a collection of objects implementing an interface (eg `Case’s "caseContents" collection) would normally only show the icon of the object; not particularly satisfactory. Moreover, this trick contributes to all implementations (FixedAsset and Party). There is however a small gotcha, in that we only want this contributed property to be viewed on tables. The @Property(hidden=Where.OBJECT_FORMS) ensures that it is not shown anywhere else.